I love recycling manicures and attempting them a second time around. If it weren't for the blog, I probably would never try a technique or a nail art look another time if it originally failed. Well, I lied, I won't ever try water marbling again, but that's just out of principle. Seriously, it wastes too much of my polish. 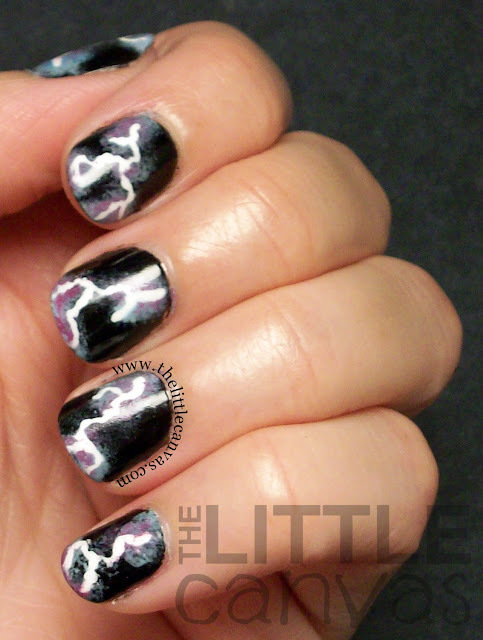 Last year, after seeing a pin on Pinterst, I attempted these lightning bolt nails. 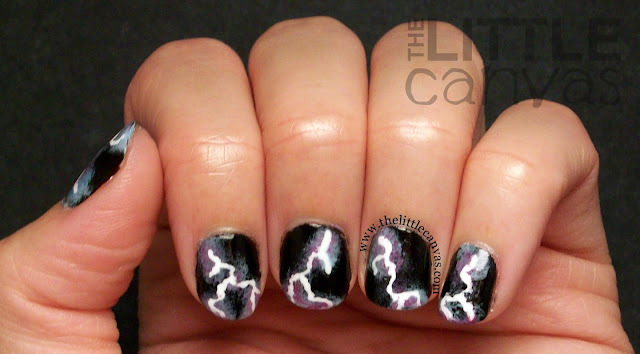 I loved this manicure, and thought it looked SOOOOO cool! 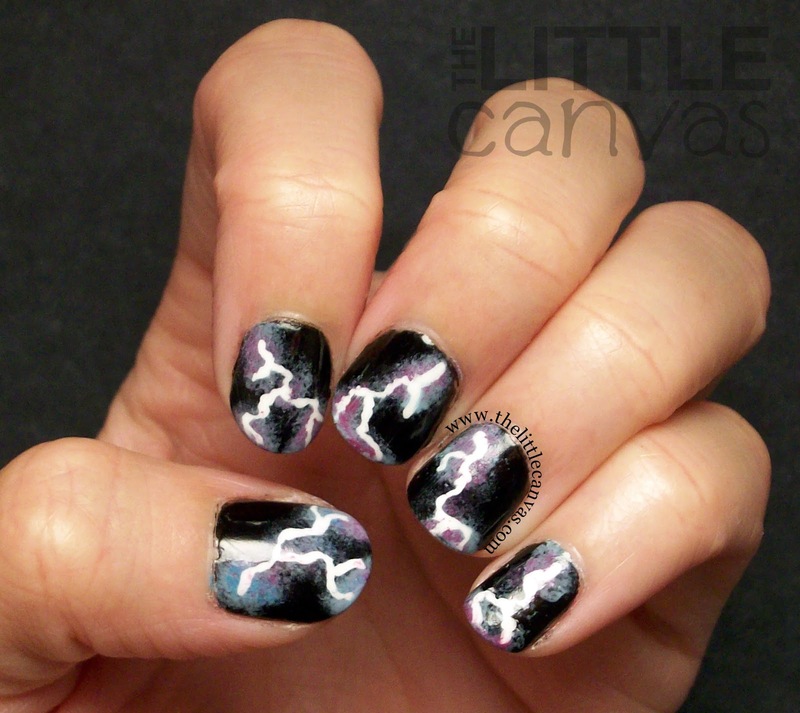 Now, if you know me, you know I loathe storms, so it was so odd that I loved the nails as much as I did. The thought to re-create this manicure never crossed my mind until I got caught driving in one of the worst storms of my life. I was coming home from one of my jobs a few weeks ago when the storm struck. There were numerous cloud to ground lightning strikes, rain and hail which quickly flooded the roads, and the loudest thunder ever. I had to pull over and wait out the storm because I was having such an awful panic attack driving in it. Come to find out later, the storm dumped about 2 inches of rain in 30 minutes and of course hit my area the hardest. After this rainy day, and very rainy summer, I thought, eh why not. Since it's supposed to storm tonight, I thought it was fitting to finally share them! So let's take a look!!!! Kind of cool, right? I think both this year and last years manicure were great attempts at this technique. I really have no complaints about last years seeing as I was a fairly new nail artist. Plus, I created last years bolts using toothpicks, where as this year I used a nail art brush. Getting the look is rather simple. First you start off with a base coat of black nail polish. I used Orly Liquid Vinyl because I think it's the best black polish ever. Full coverage in two coats and it is so shiny. Plus, it wears great too! Totally worth the price! When the coats of black were dry, I used a make up sponge and sponged on the blue polish where I wanted the beginning and end of the bolt to be. I did a little down the middle area as well. When that was dry, I used a dark pink polish and sponged it lightly over the blue. Now, when this was done, it didn't look too pretty. It kind of was a blur of colors which looked like they had no reason to be together. It all starts to fit when you add the bolt itself using a white polish. You can use a toothpick, dotting tool, or a nail art brush like I did. When that's all dry, add a top coat and trust me, it all comes together! What do you think? Enjoy this years or last years better? Any other manicures you'd like to see me re-try?? Pardon this post, I doubt it makes sense since I wrote it at midnight....again. Exhausted Alaina shouldn't be allowed on her blog, but the posts must go on!! !